Rare have been clown trios that have held the top of the bill of the most important European circuses for such a long time. Artists of great virtuosity, particularly loved by the public—they had their fan clubA juggling pin. 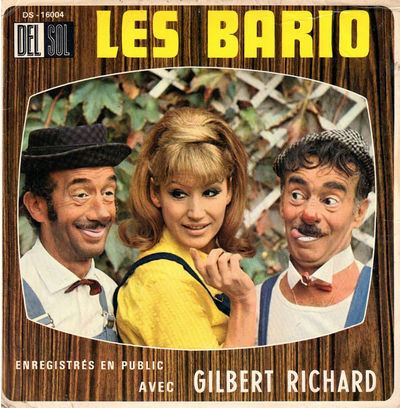 !—the Barios were also true innovators in the realm of clown comedy. Manrico Lionello (Nello, 1918-1999), the elder, was born August 28, 1918 in Alingsås, in Sweden. Alfredo Darius Bruno (Freddy, 1922-1988) was born in Brussels on December 18, 1922. Like all circus children, the two sons of Manrico Meschi, known as Bario (1888-1974), and Lily Eva, née Magrini (1902-1985), made their debut in the family act, the Dario-Bario clown trio, which included their uncle Dario (Dario Meschi, 1880-1962), their father, and a third partner that changed over the years: Félix Gontard, Rhum, Mimile, or Pépète Pauwels. Over time, their sister, Tosca, and their cousin, Willy Dario (Dario’s son), joined the troupe to participate in the act’s traditional musical finale. 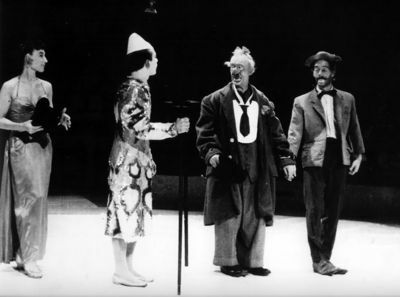 At age fourteen, Nello began to develop a threadlike hobo character named Siméon, and embarked in earnest on his clown apprenticeship, while Freddy, dressed as a rollicking groom, continued to be a mere extra in the act. Nello, Freddy, and Tosca put together their new act in 1939, during an engagement of the Dario-Bario troupe with the Cirque Franco-Belge in Roubaix, in France’s North region. Unfortunately, on September 1st of that year, WWII began and the German Army invaded France. After the signature of the Armistice between France and Germany on June 22, 1940, France fell under German occupation. Paula Busch, whose German circus empire was Europe’s largest, was offered by the German authorities the running of Paris’s two circuses, Medrano and the Cirque d’Hiver. Thus, at long last, the Dario-Barios went back to work at Cirque Medrano-Busch. There, on November 29, 1940, the Bario Juniors made their long-awaited debut as the Dario-Barios’ "second act." They were quite successful, and in 1942, they finally claimed independence from their family: They debuted alone at the Bobino Music-Hall, a famous Parisian variety theatre. From then on, they would pursue their own career in circuses and variety theatres. In 1947, Henny Sosman (1926-2011) replaced Tosca in the act. Freddy had met her in 1943 at Cirque Medrano, and had fallen in love. Henny had given him his first child, Beatrix (Betty), in 1945, before finally marrying him on March 6, 1948. Henny Jeanne Giovanna Sosman was born March 5, 1926 in Amsterdam, Holland. She was the daughter of the pianist Hendrika (Rita) Beukers and the clown Martin Sosman, better known as Tony. As good a musician as her mother, Henny, who could play Chopin on the concertina with a rare mastery, spoke fluently Flemish, French, Spanish and English. Additionally, she was a remarkable tap-dancer, and one of the main draws of the Four Sosmans’ musical act, which then appeared in Europe’s variety houses, circuses, and cabarets. Although they had signed for the beginning of the 1948 season with the Cirque Bouglione, Dario Meschi notified his brother, Bario, that he was retiring from performing. Yet Papa Bario (as Bario Meschi was affectionately called in the business) wanted to carry on; he therefore decided to form his own clown act, and approached his sons for this purpose. After some hesitation, Nello and Freddy accepted; the new clown quartet was made of Freddy as the clownGeneric term for all clowns and augustes. '''Specific:''' In Europe, the elegant, whiteface character who plays the role of the straight man to the Auguste in a clown team., Papa Bario as the augusteIn a classic European clown team, the comic, red-nosed character, as opposed to the elegant, whiteface Clown., Nello as the second augusteIn a classic European clown team, the comic, red-nosed character, as opposed to the elegant, whiteface Clown., and Henny as the straight man (or more accurately, straight woman)—and later as a third augusteIn a classic European clown team, the comic, red-nosed character, as opposed to the elegant, whiteface Clown..
After the inevitable period of trial and error, the new team began to receive contracts from the most prestigious circuses in Europe, among which Paris’s Cirque Medrano, Brussels’ Cirque Royal, Budapest’s Fővárosi Nagycirkusz, Circus Strassburger in The Netherlands, Cirkus Schumann in Denmark and Sweden, and Circus Knie in Switzerland. They resurrected the Dario-Barios’ classic repertoire, such as The Eggs, The Water Buckets, and Il Trovatore. When performing at Cirque Medrano in February of 1952, Freddy was seen as a fanciful clownGeneric term for all clowns and augustes. '''Specific:''' In Europe, the elegant, whiteface character who plays the role of the straight man to the Auguste in a clown team., able to lead his partners efficiently. Alongside Papa Bario, who had an oversized comic power (and had originated the "pochard"—a colorful drunk—type, which inspired several generations of augustes), Nello’s gangly, scatterbrained character found naturally his place. As for Henny, who had created for herself a female character with round spectacles and long braids, she added a touch of originality that brought the quartet a special quality: The critic of the French daily L’Humanité, Tristan Rémy—who was also a great clown chronicler and historian—noted that Henny was "at once the most mischievous and the most artist of all young upcoming female clowns." In 1958, during their engagement at Circus Knie, in Switzerland, Papa Bario fell seriously ill. The Juniors had no other choice than to take their own destiny in their hands. To respect their engagements they decided to form a trio with, in the part usually held by the clownGeneric term for all clowns and augustes. '''Specific:''' In Europe, the elegant, whiteface character who plays the role of the straight man to the Auguste in a clown team., Henny leading the act in evening gown, Nello in his usual role, and Freddy taking his father’s place as the principal augusteIn a classic European clown team, the comic, red-nosed character, as opposed to the elegant, whiteface Clown.. This new formula, with a woman leading the game, didn’t conform to the well-established rules of the genre, and was a risky bet—especially since a period of adaptation was needed indeed before Henny and Freddy could find their marks. Yet, thanks to their talent, hard work, and to Nello, who, notwithstanding his frail and fragile stage persona, was in actuality the rock on which the new trio was built, Freddy and Henny quickly found the right measure of their characters, and in spite of unavoidable criticisms, the trio progressed steadily. In December of 1958, Henny, Nello and Freddy Bario were featured in Le Grand Cirque 59, the circus show presented for the Holiday Season at Paris’s Palais des Sports, with their extravagant Citroën painted yellow with red dots and developed by Nello, which exploded, fell apart, and whose front end eventually separated from the back. The Barios then went to Medrano, and after that to the Cirque Napoléon Rancy, where they revived Papa Bario’s old classics. In less than two years, Henny’s and Freddy’s stage personalities had shaped brilliantly. Henny, with her beauty, her charm, her elegance, and her talent, took aback the most jaded audiences. Freddy, who had modernized and refined his appearance, emerged as a sharp-tongued, rollicking comedian. As for Nello, the perfect idiot, the third wheel of the tandem, he clearly blossomed. 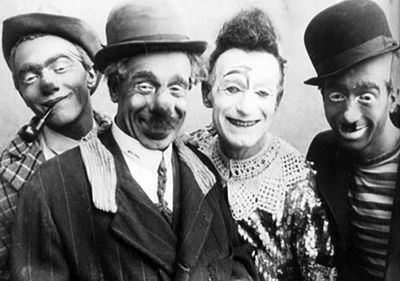 Their personalities, altogether different and complementary, resulted in a unique trio, exemplarily modern, which quickly brought back to the circus an audience that appreciated clown comedy at its best. Each of their sketches was built around a precise scenario, and peppered with effective visual gags and punch lines that hit. The musical pieces that traditionally concluded their act, or were presented independently (either with traditional instruments, or with eccentric instruments such as hammers, musical gloves, or bicycle horns), added an artistic dimension to their repertoire that delighted their audiences. The Barios were always eagerly awaited, appreciated, applauded, and mostly, loved. Considered in the European circus business as the best clowns of their generation, the Barios became genuine circus stars quite naturally. They appeared, among other circuses, at Circo Price in Madrid; at the Hippodrome of Great Yarmouth in England; and in France at the Cirque Jean Richard, the Cirque de la Voix du Nord in Lille, La Piste d’Or, and for five seasons at the Cirque Spirou created by Jean Nohain, an extremely popular French television producer and personality. 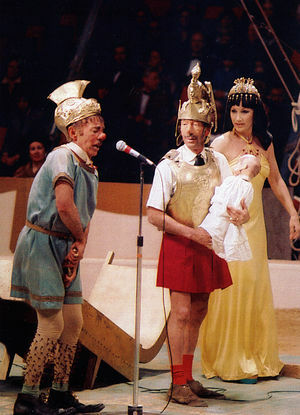 Starting in 1966, the Barios participated regularly in television shows produced by Jean Nohain, Guy Lux, Gilbert Richard, Jean Richard, and many others, including (in 1960 and 1965) La Piste aux Étoiles, one of the most popular variety shows on French television, which made them known in the most remote parts of the country, and transformed them into media stars. They also participated in several television broadcasts in Europe: The scope of their repertoire, whether mute, spoken, or musical, made them ideal candidates for recurring appearances on the television screen. 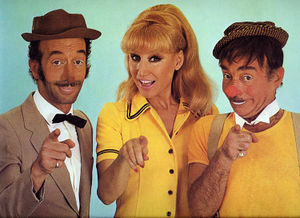 Following Papa Bario’s death in June of 1974, the Barios worked mostly on television, and during the summer, on tours of the French seaside resorts with the Cirque Spirou and other similar circuses. They made their final public appearance in the spring of 1988 at the Mondial Circus of the Rech Family, with which they had done their summer tour, and which was set up in Paris, at the Porte Maillot. Freddy, who had been recently diagnosed with lung cancer, was already very weak; he died a short time later, on July 10, 1988, at age sixty-six. The Trio Bario disappeared with him. Although Nello himself had surgery for a cancerous tumor in 1986 (and had been cured), he survived his brother for ten years. He passed away on December 8, 1999, at age eighty-one. (Nello married Amélie Gineston (1918-1998) on February 15, 1945; they had two daughters, Nadine and Ivane.) After Freddy’s death, Henny had continued to work with various partners, among whom her son, the musician and bandleader Tony Bario (1954-2007), her daughter Betty (Beatrix), and her nephew Willy Dario. She was also featured in the show Achille Tonic, with the popular French comedians Dino & Shirley in 1999. In 2002, as Henny was on her way to Lyon for a series of performances, she suffered from a brain hemorrhage; she recovered, but this accident put an end to her performing career. Henny Bario, the last surviving member of the legendary trio, finally passed away on a Christmas Eve, December 24, 2011, at the Hospital of Bobigny (the Paris suburb where she lived); she had suffered another brain hemorrhage. It was heartbreaking news for all those who, for thirty years, had loved and admired the Barios—and they were indeed countless! Freddy and Henny Bario are buried at the Pré Saint-Gervais Cemetary, and Nello at the Cemetary of Dammarie-les-Lys, both near Paris.